﻿ What materials keep out bats? What materials keep out bats? The good thing about bats is that they don't chew through stuff, so the materials you use for keeping out bats doesn't need to be quite as long-lasting and durable as the kind of material you would need for a rat, for example. Rats are well known for chewing through pretty much anything you could think to put in your path, so you would need to be very specific — and careful — with the materials you use in order to successfully keep them at bay. For the exclusion devices themselves, you can create your own custom piece with a bit of time, patience, and the right materials. Window screen can work well for this, alongside poly netting — the quarter of an inch stuff. If you opt for netting that has too-big holes, the bats can easily get stuck in them, fly through them, or end up dying all wrapped up in them. You could try your hand at making a funnel too, although you you can just buy exclusion-style devices, like one-way doors, for nuisance wildlife. In the right places, they can work for most animals. We do not recommend making anything at home to help exclude or get rid of bats, unless you know what you are doing. This situation has the potential to go wrong, and when you accidentally kill or maim a couple of bats, you're actually breaking the law in many states. When it comes to sealing up any holes you actually have more than a few materials to make your choice from, and you can use one or a combination of items to build a physical barrier that is impossible to overcome. Expanding foam can be used on conjunction with wire wool or hardware cloth, or even alone — the bats can't chew through it, so as long as you make sure that your repair and sealing spots are well maintained, you shouldn't have any problems. 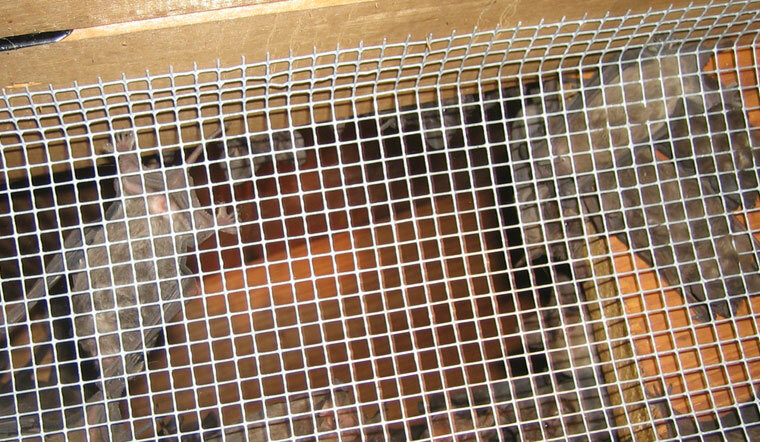 Netting can be used in really problematic areas, although, you will want to make sure that the holes are small enough to prevent the creatures getting tangled or flying through. This might not be the best approach when you want a space to look good either — the netting over an entire roof, for example, is not going to be the most aesthetically pleasing option. Go back to the Bat Removal page, or learn about bats in the attic with my Bats in the Attic guide. Bright lights & loud noises for bats — does any of it work?